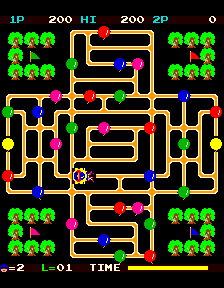 Van-van Car is a single screen maze game where your objective is to clear all the balloons in the maze and destroy/avoid the enemy cars. There are three types of ballons to burst on the screen. The normal type which are coloured red, green, purple or blue simply award you points. The Energy ballons (marked with an 'E') give you the power to fire a single rocket destroying anything in your path along the horizontal or vertical axis you are on when you fire it. Lastly there are the multicoloured bonus ballons; when you burst one of these it bursts all the other balloons on screen, clearing the level. Holding down a direction will cause your car to move in that direction. However, your car will continue to move in whatever direction it was last travelling, even if you are not holding a direction or if you are holding a direction it cannot go, albeit at a slower speed. Cars can overtake and crash with you at this lower speed. 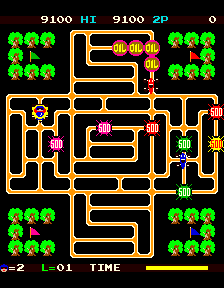 The enemy cars move around the maze in the same way you do, but with the sole intention of ramming you. On later levels there are static cars placed on the maze to be avoided. There are also oil slicks dropped in various locations on the maze by the enemy cars, which cause your car to spin and keep moving in the direction you are facing, but also speed you up until you turn a corner. They can become quite a hazard when there are several grouped together with ballons in between them. As well as the ability to fire the rockets you collect, when unarmed your car has the power to jump. You can use this ability to jump over enemy cars to avoid them, cross from one part of the maze to another not directly connected by a road, and you can also jump over balloons. However, if you land on a ballon when you jump, it is not destroyed and you must back up to burst it in the normal way. You are also playng the game against the clock as each screen has a time limit, shown by a timer bar at the bottom of the screen. You must clear the screen before the time runs out, or you lose a life. Jumping Enemy Car: 100 points. Destroying Enemy Car: 1,000 points. Bonus Balloon: 500 points for each remaining balloon. End of level bonus: Extra points awarded for time remaining. Van Van Car is not a hard game, but it will have you pounding walls, the controls, or younger siblings in frustration. Be prepared to die a lot of very stupid deaths, particularly when you're learning the game. The game is about minimalist control - try to avoid making sudden movements or jerky motions, as you'll generally end up accidentally switching tracks or losing speed and being rammed. Also try to avoid twitch jumping when enemy cars are close - while in the air, you have no control over your car, so enemies will run right underneath you, and they do not make for a soft landing. Try to plan a path and move smoothly through the maze, avoid sharp turns, and jump cars coming head on only. If you're being pursued closely, look for a break in the maze that you can jump over and gain an extra second or two on your pursuer. DO NOT try to turn and jump. You're asking for a crash. The bonus balloon appears when there are eight balloons left on screen. Try to collect it without bursting any more balloons as they are worth a total of 3,500 points when you collect the bonus. Try to save your missiles to fire them in a long straight line picking off as many balloons as possible, and hopefully destroying more than one car. Don't collect another energy balloon until you have fired the missile awarded by the last one, otherwise the second missile will be wasted because you can only carry one at a time. Enemy cars cannot pass through balloons; they have to go around them. 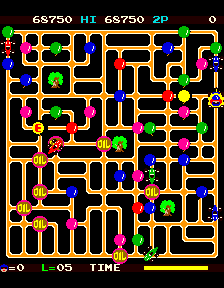 This can be used to the player's advantage as the player can jump on a balloon while being pursued by an enemy, and the enemy has to back off and go around. When you fire a missile, and an enemy car is turning near the axis you fired on (but is not actually on the axis) the missile will destroy the car, even though it technically does not hit it! Enemy cars do not beeline for you automatically. Only after popping a certain quota of balloons (or perhaps by taking a certain amount of time) do they start coming directly for you. Therefore, for the first little while in a level, you have time to plan out which balloons you need to go for immediately and which you can save for later. You also want to save your missiles for when enemy cars are actually chasing you - not merely idling around the maze. It's important to note that some tracks can be deceptive - balloons will cover up key turning points, making it appear that there is straight road where there are actually curves. These are good balloons to take out early on in the maze when you aren't being heavily pursued. Oil slicks are a useful item in the game. Since you speed up by running over one (although you can't jump, you gain about 2x your normal speed while spinning), they allow you to make a quick escape from enemies, particularly when said enemy is right on your tail. The game repeats itself after 12 or 14 levels, starting back on level 1 and slowing down considerably.